The overlap between tax accounting and income tax law continues to grow, and the result is increasing complexity. Frequent changes and ongoing evolution in both fields give practitioners a lot to keep up with. To assist practitioners in identifying issues, structuring their planning, and efficiently meeting all applicable requirements, Corporate Income Tax Accounting sets forth the current realities and provides practitioners with tools and strategies. The topics addressed in Corporate Income Tax Accounting come alive via illustrations, which have been included throughout the book. 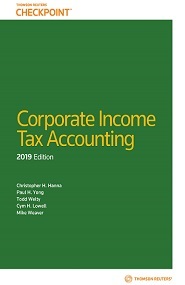 The authors have utilized a full range of direct and indirect income tax subjects to illustrate application of the pertinent financial accounting concepts.